Here at Unfinished Man, we know the importance of school and also understand the obstacles that face a lot of students worldwide. Students are greeted with a constant barrage of expenses such as monthly student lodging, food budget, travel fares, book costs, and in most places, even the actual fees for the courses each student wants to take; it can be a tough road ahead financially. It can be especially difficult to manage all these bills and monetary restrictions when you are on your own. The student life can have many unexpected turns and twists, and it is always a good idea to have some funding saved up in case life throws a curve ball at your direction. Here at our humble website, we would like to offer a small gesture of assistance and appreciation for our student readers. Because after all, when you are struggling with the pressures and demands of student life, sometimes you just need is a small break: a helping hand to make your day, week, or even semester, a little bit easier to go through. We are proud to open an annual essay writing contest for our readers and their loved ones, with the main goal of assisting students in their expenses wherever they may be. 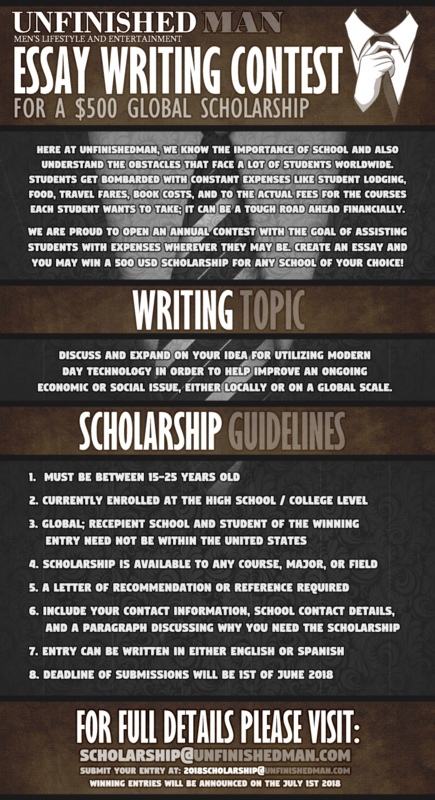 Simply create an essay and you may get the chance to win a 500 USD Scholarship for any school of your choice! The challenge we are offering is a simple one. Tell us how you think modern everyday technology can be used or integrated in improving an ongoing social or economic issue concerning your local area, a specific area involved in the news, or the planet as a whole. Impress us with your idea and your passion for learning, and you just might be selected as the winner of this yearly event! The winner gets 500 USD for the school of their choice, which they can use in that institution for whatever purpose they see fit. The deadline will be the 1st of June annually, with one winner being chosen by our staff on the first week of July. All interested students currently under any major or field can apply for the scholarship. To be able to join in the contest however, the student must demonstrate the need for financial assistance in their current studies. Each entry must be approximately one page in length and can be written in either the Spanish or English language. Essays need to be 500 words or more, and must revolve around the topic of the contest: Discuss and expand on an idea you have for using/integrating modern everyday technology in order to help improve an ongoing social or economic issue, either on a specific locale or on a global scale. Deadline for the submission of entries is the 1st of June 2018. Please make sure all necessary paperwork are sent in before then. The scholarship reward recipient will be chosen on the 1st of July 2018, with the funds being delivered to the winner’s school financial aid department. The reward will be sent directly to the school of their choice after establishing and confirming the parties involved. All private and personal information sent to us via this competition will not be shared with anyone for marketing and other commercial purposes. Elements of the essays will not be given, sold, or shared to any party outside the commission delegated in going through the entries and choosing the winner. The winner’s name and/or photo will be displayed and showcased on our website solely for the purposes of promoting this official scholarship competition. So to our interested site members, good luck and happy writing!